To round out our series of winter motorcycle gear guides, we scoured our inventory and decided on three groups of winter motorcycle gloves. We broke it down into "Cool Weather Sport Touring Gloves," "Cold Weather Touring Gloves," and "Extreme Cold Weather Adventure Gloves." As you move through the ranks, the materials used improve, including protective elements and creature comforts, and you get vaster temperature range & precipitation coverage. 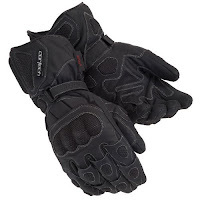 The rider who is riding five miles back and forth from work won't need a brawny glove in all likelihood just as the adventure touring rider in freezing temperatures will want to look for something more bulky than a basic winter riding glove. That explains how we broke down our categories. Let's get into the video, our Cold Weather Motorcycle Glove Guide. 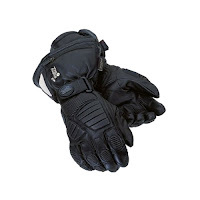 In our first bucket of gloves, the milder temperature range array, you'll find motorcycle gloves from Firstgear, REV'IT! and Cortech. The Firstgear Navigator glove and Firstgear Kilimanjaro glove (pictured at left) each feature a Hipora waterproof breathable membrane that will keep your hands dry while the Kilimanjaro has Thinsulate for the lining and the Navigator uses a warmer Thermolite liner. Consider the Navigator the leather counterpart to the Kilimanjaro. 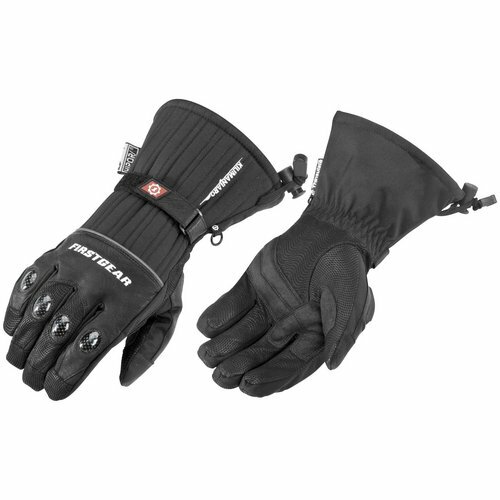 Both these gloves perform well in cool to cold weather basic riding scenarios. The sportiest looking glove of all the gloves we show in this video is the Cortech Scarab glove, constructed from a mix of leather, goatskin & textile. All of this is backed with a Hipora waterproof breathable membrane. For protection, the Scarab has a molded titanium/carbon knuckle with finger and wrist protection as well. The top-of-the-line glove in this group is the REV'IT! Zenith H2O glove, which provides a mix of goatskin and leather with coated carbon hard shell knuckles. The upgrade here being the Hydratex membrane from REV'IT! which will be more breathable than the waterproofing in the other gloves. The addition of SuperFabric on the pinky is another upgrade on this top-end cool/cold weather sport touring glove. In the next lineup, you're looking at Cold Weather Touring Gloves that will stand up well to all the elements and a deeper temperature range than the previous grouping. Here you'll find gloves from REV'IT!, Tour Master, and Held. This is where you'll start to see advanced technologies such as Gore-Tex membranes and so forth. The Tour Master Winter Elite Glove is the starting point for this bunch and also the thickest. Constructed from goatskin and sheepskin with Thinsulate Liteloft insulation, the Winter Elite also features a visor wiper for convenience, a large storm cuff, and a built-in nylon polar cover for the extremes of temperature and precipitation. From REV'IT!, the new REV'IT! Orion GTX Glove features Gore-Tex while the REV'IT! Kelvin H2O Glove was voted WebBikeWorld's Best Winter Glove 2009. The Orion is 1000D ripstop Cordura and 500D PWRShell with a Thermolite tri-fleece liner. The distinguishing factor is the Gore-Tex membrane that gives the highest level of waterproof breathability. Period. The Kelvin (pictured) is a full leather construction with Hydratex waterproof breathability. The distinguisher here is the Schoeller PCM Insulator which is a temperature regulator that absorbs heat. If the hand is too hot, the PCM absorbs it and your hand cools; if your hand gets cold, the PCM releases the heat. Rounding out this group is the Held Freezer Glove, a water-repellent cowhide glove with a Gore-Tex membrane for waterproof breathability. The lining here is what's special: Primaloft, used by the military, is an extremely lightweight microfiber insulation that stays amazingly warm no matter the application. That does it for category two. 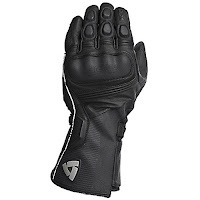 If you're an Adventure rider or you want to ride really long distances in the cold weather, you need look no further than this group of gloves. 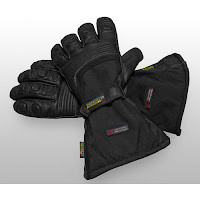 These are the extremely technical gloves with the most futuristic technologies and extensive R&D. 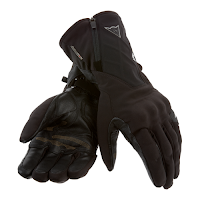 The Gerbing's T5 Heated Gloves are the only pair in this group that is heated and are best suited for the rider dipping into the lowest possible temperature ranges. Gerbing's Microwire Heating Technology was developed at the behest of the military. 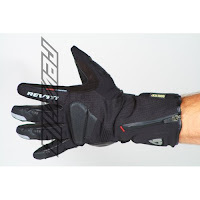 Two gloves from REV'IT!, the REV'IT! Alaska GTX Glove & REV'IT! Bastion GTX Glove (pictured at left) feature Gore-Tex membranes, the Alaska being the leather alternative to the Bastion's extreme textile construction. Both of these gloves will handle the freezing elements with comfort and style, with the main differentiating factor being the SuperFabric and MotoGP elements that are in the Bastion. The Held Warm N Dry glove is Held's highest end cold weather glove. With a mix of cowhide, textile and goatskin, the Warm N Dry also has a Gore-Tex membrane for waterproof breathability. SuperFabric provides reinforcement, the knuckles are protected by hard plastic armor, and the liner is Gore-Tex Thermoplush Fleece. 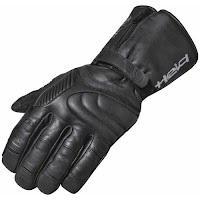 Keeping in mind the Adventure Touring rider, Held kept the palm on these gloves thin enough for use with heated grips. This is a great Extreme Cold Weather glove. 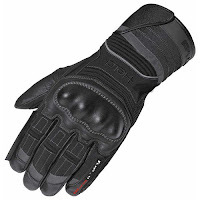 Finally, our last glove is the Dainese Jerico Glove, probably the slickest and cleanest design of the bunch. The Jerico is made from Cowhide-Clarino, a synthetic abrasion-resistant textile material. It has a full Gore-Tex membrane and utilizes Primaloft insulation. 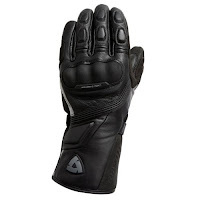 It is the highest-priced glove for a good reason: it outperforms every other glove on the table and of course, offers that classic Dainese style. That's quite a bit of information but we hope very informative. Our intention is to take some of the pain out of figuring all these details on your own. We hope we met our goal of connecting the dots in terms of subtle differences of winter motorcycle gloves.